During our 20 or so years of serving clients in and around Caversham, we are pleased to have received many cards and letters offering thanks and appreciation for our help. We of course realise that many of the situations we are called on to assist with can often be very stressful and traumatic for the client. We do our utmost to ensure each client is served professionally and treated with the care and respect that you would expect. Divorce, death, and family disputes are not generally joyful things, but we do also help out with the more exciting things in life, such as buying a new house, creating civil partnerships, or getting married abroad. Whatever your situation, if you live or work in Reading, Caversham or the surrounding areas and you feel you could do with some legal advice or assistance, please feel free to get in touch with us. We’ll be only too happy to speak with you. Below are some examples of happy clients…although in most cases, due to confidentiality reasons, we cant name names! by client from Reading on Caversham Solicitors Ltd. Thank you for dealing with the lease extension in such a professional manner, I would have no hesitation in using your services again or recommending you to friends and acquaintances. by JAMES BISHOP on Caversham Solicitors Ltd.
Robert and his conveyancing team recently helped me in the purchase of a house for my father. After flirting with alternative providers, we ended up coming back to Caversham Solicitors to get the job done. The service was swift, professional and complete and the fact the team were contactable and helpful made things all very easy. Based on my experience so far, if anyone is considering buying or selling a house, then I wouldn’t hesitate to recommend Robert and his team. 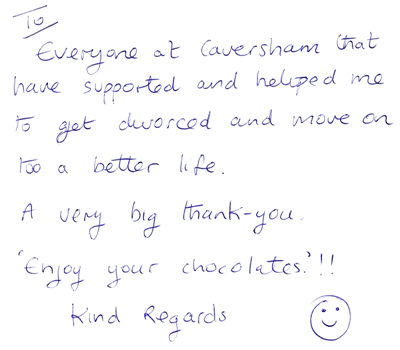 by A satisfied client on Caversham Solicitors Ltd.
To all at Caversham Solicitors, including a very friendly receptionist! For all the work you have done in selling my fathers house, and our purchase of the house in Weston. We will be in touch again in due course with regards to selling our Caversham home. by Emmer Green on Caversham Solicitors Ltd. Thank you very much for completing and sending my Aunt’s Will and the General Power of Attorney. It is a relief that we will be able to manage her financial affairs more professionally. My Aunt is less anxious now her will has been adjusted and was very happy with the way you managed it. We are also very grateful to you with the excellent and tactful way you handled a delicate situation, and particularly with the efficiency and speed with which it was executed. We wait for the lasting power of attorney which we appreciate will take longer to action. We enclose the completed client care questionnaire with our thanks. Helpful, understanding, response time, cost, No Jargon!. ..1. An immediate or swifty replied answer to a phone call by someone knowledgeable, polite and with a happy voice. 2. Good references. 3. Efficient service with clear detail. 4. A fair price. You gave us 1,3 & 4 and we will give you 2!. I’m so glad everything has been finalised. 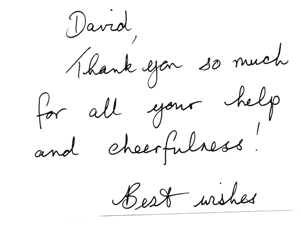 Both Davids were very helpful and so were you, Mr Last. Thank you very much for all you have done. What would I have done without all your expert help? I believe that’s the end of our association for now, but in the event I should need any further legal assistance, I know where to go: Caversham Solicitors! Just a little note to thank you for your hard work in helping me through this very difficult time in my life. It was a pleasure to have you working for me, to bring me back down to earth sometimes and to be able to leave your office smiling. Please also say thank you to your receptionist who was also very kind. please find enclosed an invitation as promised. Thanks for your letter dated 19th over November and previous correspondence concerning the above matter. Much as it goes against the grain I can see it makes sense to bring this whole matter to a close. Therefore, I enclose my cheque in the sum of £4.92 for forwarding on to Direct Line Insurance. Furthermore, may i thank you and your colleagues for all your help and guidance re the above. once again Caversham Solicitors have come up trumps! Please let me know if there are any further fees owing to you. - Caversham Solicitors coming up trumps!